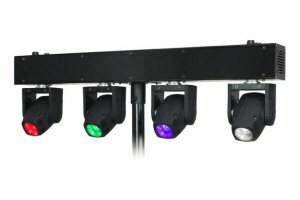 The new 2015 Equinox Slender Beam Bar Quad is powered by 4 x 10W CREE quad-colour RGBW LEDs to produce narrow, bright beam effects. Four user selectable shows are included which allow a choice of light shows for venue installation or limited movement shows which are ideal for mobile DJs and entertainers who only want projection towards the audience. Standard features include auto, sound active and DMX modes and the added CA-8 easy remote control socket further adds to the versatility of the fixture. DMX & power in/out for daisy chaining make easy work of set-up or installation.